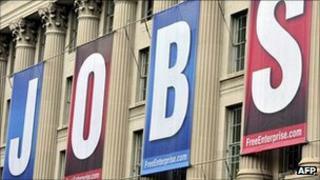 It is President Obama's big speech on jobs tonight. Big? Many commentators are convinced there will be nothing new in it. The markets have discounted it. Congressional Republicans aren't waiting with bated breath. But it is a big deal for those who want to believe in Mr Obama. I've been to Richmond, Virginia's state capital, to hear from a couple of people about what they expect. Despite the recession, Jeff Neal's electronics business Commercial One has boomed. His electronics firm rewires homes and companies, and business is booming. At the depth of the recession, he was down to one employee - himself. Now, he employs eight others and is hiring more. His slogan is: "building a tradition of excellence one project at a time". "The economy is not good, obviously, but this environment is going to promote true excellence." But he says certainty about work is important. "I don't want to hire anybody today that I am going to lay off tomorrow." He voted for Mr Obama in 2008 and thinks this is an important speech. "He has had time to receive all the information and is about ready to make some decisions. It's been a long time coming; some say it's overdue. I'm waiting to see what he's got to say." Mr Neal says he hasn't decided if he will vote for President Obama next year. "You don't get excellence by compromise and I want to see a president that is willing to stand on what he was elected for, and push that forth with sincere tenacity. "Like with my company - if you don't get the job done, you are removed. If things don't change, things will change. I guarantee that." Another Richmond resident, Barry Griffin, also voted for Mr Obama. He has done less well in this economy. Mr Griffin lost his job designing tiles, kitchens and bathrooms a year and a half ago. He is an artist and it is clear from the book of his designs he shows me that he has flair and talent. But in the last 18 months, he has found no permanent job. Mr Griffin did work part-time for a similar company, earning very little, but hoping things would look up and that it would become full-time. Instead, the business shut down. He has a lovely 1920s home and wanted to do it up in style. He's now selling off the materials he bought, to keep up the mortgage payments. "It's not just about finding a job. It's finding one that's going to last. "It's looking pretty grim when we can't feel that there is hope on the horizon, that something dramatic is going to happen, that we are going to be able to get back to work and pay our bills. How can we have confidence? "It's really disgusting, because I work hard. I was raised by parents who taught me that if I work hard, there would be reward and I don't see that right now or hope for that happening. My confidence is pretty much non-existent." He just hopes Mr Obama's speech can give him reason to be slightly more optimistic. "I hope that he pulls a rabbit out of his hat. I hope that he enlists help from all of Congress, because I really don't know what the next step is going to be without some magic." But Mr Griffin says he is appalled by the way Congress has been behaving. "I can't understand why we can't entertain things we've never entertained before in times of dire need. If our children were bickering, what would we tell them? "If we had that bickering in the workplace, what would we do? We'd say 'develop teamwork, work together'. If they believe in big business, take some lessons from it. Brainstorm. Come up with solutions. "All I have seen is a bunch of adults acting like children and it's saddening. All of us Americans are suffering the consequences. And the rest of the world is looking at this. "Sometimes I am proud of being an American, sometimes just embarrassed. What's been happening in Congress just embarrasses me." There are not high expectations in Washington for tonight's speech, but I have a feeling it could be a pivot point for those who want more from their president.